TEKEASE certified technicians are available for emergency same-day, weekend and evening service calls. To request service, please enter the details of your request in the form below. 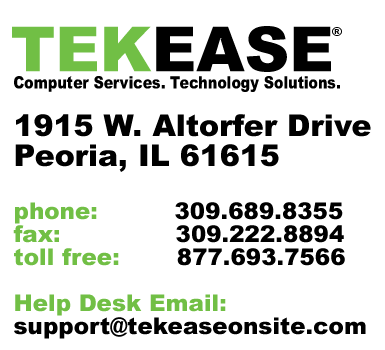 A member of the TEKEASE team will contact you promptly to discuss your requirements and will provide you with an estimate for services. You will receive an email confirming your request and you may check the status of this request in our system at any time. Please Note: All calls are returned during normal dispatch hours of Monday thru Friday from 9AM to 5PM. If you have an after hours emergency and require premium emergency assistance, please call 309.689.8355 or toll free at 877.693.7566. Please provide a brief problem description. What operating system do you have? * - Your Operating System -	Windows 10	Windows 8	Windows 7	Windows Vista	Windows Other	Apple Macintosh	I have no idea! PRIVACY NOTICE: We do not share or sell your information. TEKEASE adheres to the highest standards in client confidentiality.